It is probable that the slate quarries were some of the first tourist attractions. Indeed, by 1910 a shop was selling souvenirs made out of slate by the entrance to the Penrhyn Quarry. Visitors from far and wide came to view the industrial wonders. And whenever a royal personage came or an important local celebration to mark, rock cannon were fired. This was not unique to the quarry producing areas. Rock cannon were fired at the Parys Copper Mines at Amlwch, but they were found also in many other industrial areas on mainland Europe. The tradition in Wales dates back to the mid eighteenth century it appears. 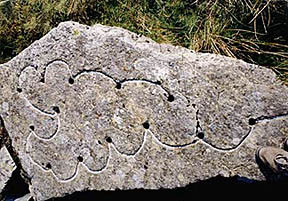 In Gwynedd up to December 2001, 235 such sites have been located with 6,157 firing holes to them. Boring holes into suitable smooth rocks formed the rock cannon. These holes were on average 125 mm in depth and between 25 mm and 32 mm in diameter. The holes were linked to each other in the earliest instances with smearing of goose grease. And before the invention of the safety fuse goose quills were used. Later on a channel would be gouged out starting from the first hole and linking each one. Around 57 gms of black powder would be placed in each hole. Powder would also be placed in the channels. There is plenty of evidence to rock cannon being fired. 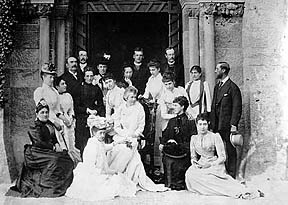 They were heard in 1859 when Victoria and Albert paid a visit to Castell Penrhyn, when Queen Elizabeth of Roumania came in 1890 and when Albert Edward and his family came to Penrhyn as part of their visit to the National Eisteddfod of 1894. This was probably the greatest royal binge of all times in the area. George William Duff Assheton-Smith, heir to the Faenol estate, came of age in 1869 and great were the rejoicings.